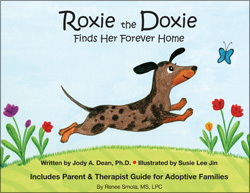 I knew right away that I wanted to illustrate Dr. Jody Dean's heartwarming story about a dachshund finding a "forever home." While making the final book art, my family also found and adopted a sweet cat of our own, so the joy of pet adoption was definitely on my mind. Hurray! MINE! 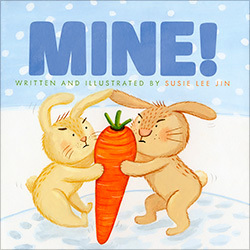 is my first picture book, about a bunch of bunnies fighting over a big carrot. Check it out at Simon & Schuster's website by clicking the book cover pic on the left. * CLICK HERE FOR Coloring & Activity Pages! This is the first book that I ever wrote and illustrated. My silly monkeys exhibit an equal share of good table manners and monkeying around. Busy little monkeys need their rest. Tuck in your little ones with this bedtime book, and get ready for a good night's sleep. Call a buddy, and let playtime begin! This fun book shows your little monkeys good playdate manners that will make everyone smile and have a terrific time. * CLICK HERE FOR Monkey Bookmarks & Finger Puppets! 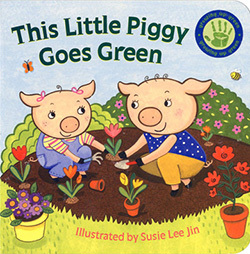 This board book is an earth-friendly update of "This Little Piggy." This little piggy checks out a book at the library, eats apples in an orchard, plants veggies in a garden, and recycles cardboard into a fun house. What a good, green little piggy! Also, the book itself is made of recycled paper and printed with natural soy inks. 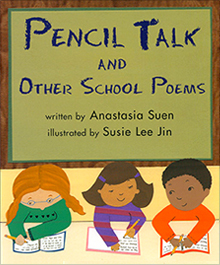 This book of poems written by Anastasia Suen captures the everyday experiences of elementary school. The seemingly long wait for recess, eating in a noisy lunchroom, and riding a bumpy bus to and from school-- her vivid poems match my memories, and I was happy to illustrate them! Books come in packs of six (6), in English or Spanish. A curriculum guide is also available. For more information or to order books, please click here.